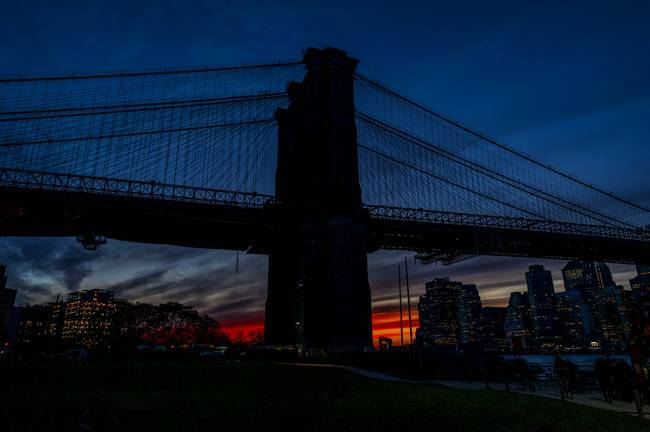 Affordable posters and prints of the Iconic Brooklyn Bridge Landmark. All Images on this page are the rightful property of New Yorkled Magazine. Sharing in an unauthorized manner is not allowed. Thank you for passing through and please help support this site through the purchase of an item. Simply Click away. Midway across the Brooklyn Bridge one comes across one of the two towers with double arches. With the cable webbing which seemingly surrounds one it feels as if one is in the spiders lair. Just a couple of NYC’s Bridges as seen in the evening as they span across the East River just to the east of Manhattan Island. One of the Brooklyn Bridge Towers in NYC stands mightily against the sky on a beautiful day. Abstract view of the path across the Brooklyn Bridge in New York City as seen at sunset against a blue sky. Spanning across the East River is what’s more than merely a mode of transport but rather an iconic representation of what NYC is all about. As seen along our trip up the East River is the Brooklyn Bridge with some of Lower Manhattan’s other landmarks and architectural structures in the backdrop. Up Close View of one of the Arches of the Brooklyn Bridge which is found spanning across New York City’s East River. One’s approach towards the center of the New York City Brooklyn Bridge reveals one of the two arches. Abstract view of the Brooklyn Bridge Arch in New York City. One of New York City’s most cherished landmarks stands mightily against the sky during the blue hour as the sun sets in the distance. Visible as well would be part of lower Manhattan. One of New York City’s most cherished landmarks stands mightily against the sky during the blue hour as the sun sets in the distance. One of the bold looking towers of the Brooklyn Bridge stands mightily with a brave sky behind it in this Black and White representation of this iconic NYC landmark. Featured here in this image is primarily the Brooklyn Bridge as it spans across the East River with a wonderful sky as a backdrop. Just beyond one can spot the Manhattan Bridge as well. The grand and beautiful Brooklyn Bridge spans across the East River onto the borough of Brooklyn in New York City on a gorgeous day. A shot with which yours truly simply HAD to have fun with as is almost obvious from this image. What with the perfect reflection and all. Some of the sights in NYC can be so wonderful if captured just right in the evening. Stretching from Manhattan Island onto Brooklyn are the Brooklyn and Manhattan Bridges as they bridge the gap made up of the East River. These two beauties can be quite the sight on the right day at the right hour. 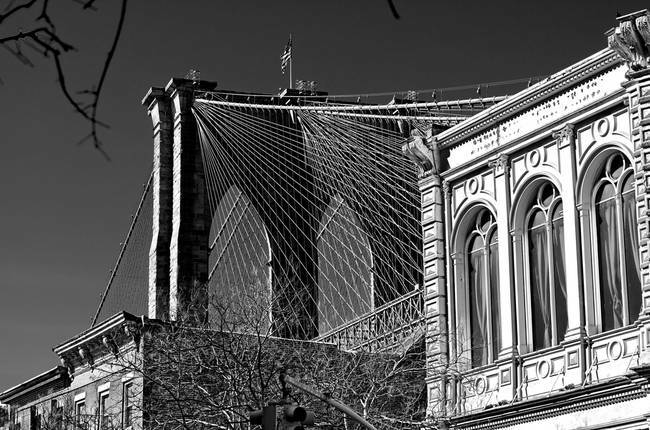 Part of one of the Brooklyn Bridge Towers along with all its cabling is seen in this black and white image. Spotted from a nearby street in this photo featuring as well local buildings. One can’t help but stand in awe when coming upon any one of the two towers of the Brooklyn Bridge. Especially on such a glorious day as when this image was captured. Pictured here is one of the two towers of the Brooklyn Bridge as it soars into the beautiful sky on this captivating day wherein the clouds, air and breeze had everyone mesmerized. Captured at the sunset hour not long before the blue hour on day prior to the first of Spring. 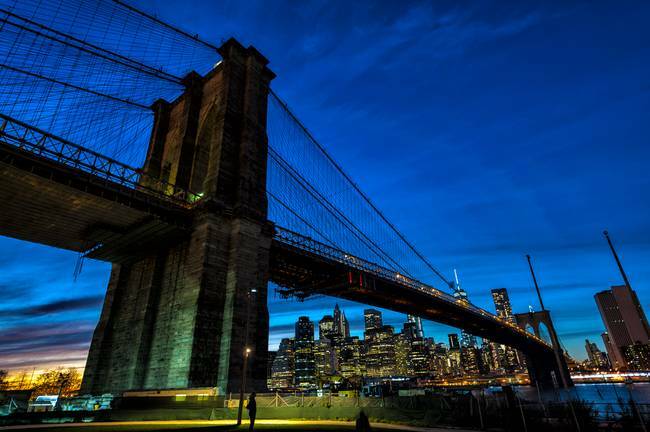 The Brooklyn Bridge was opened to the public on May 24, 1883. Just as with many of our other NYC bridges, this bridge at its opening was the largest suspension bridge in the world. Yet of course every new feat’s glory must come to an end. Or has it? You see today this beauty may not be braking any records but it certainly has never lost its charm.Still magnificent as it spans across the East River to bridge the gap between Brooklyn and Manhattan, this bridge is still considered to be one of the most famous of them all….’and also one of the most beautiful.Yes, New Yorkled’s walked across it countless times not for the sake of getting to the other side. No. But simply for the joy of it all. It’s a great feeling and one which everyone should experience upon their visit to this great city.So friends…..it is with great sincerity that you enjoy the rest of our collection should you not choose to purchase anything….’and hopefully you’ll walk away having learnt a thing or two about New York City’s makeup, her history and her charm.Image was taken from a boat passing by underneath along the East River. The waterfalls of the East River were quite the event in NYC during the year of 2008. Unfortunately they were the center of controversy as well. Despite the politics involved yours truly didn’t think too much of their aesthetic quality during the daytime. But come night? They were absolutely beautiful. This one image hilights the waterfall located underneath the Brooklyn Bridge on a wonderful evening. Actually, this image was captured on September 11, 2008. As seen in this image are the Fiboro Bridges bridging the gap between Manhattan and the boroughs of Brooklyn and Queens. Pictured here is the Brooklyn, Manhattan and the Williamsburg Bridges.Here we’re facing northward as skies of wonder cast quite the wonderful glow beyond. The waterway you see there is the East River. With traffic going at an extremely mild 5-10 miles per hour New Yorkled couldn’t resist snapping this shot while driving across the Brooklyn Bridge. It was yet another ecstatically gorgeous day in the city as we drove across the East River from New York City onto the borough of Brooklyn. Yours truly has had many a fond memory of crossing this bridge on foot and here’s yet another memento from having gotten across this historic and beautiful bridge. Join New Yorkled in its continued journey? A dual illusion of the Brooklyn Bridge set at night in NYC.